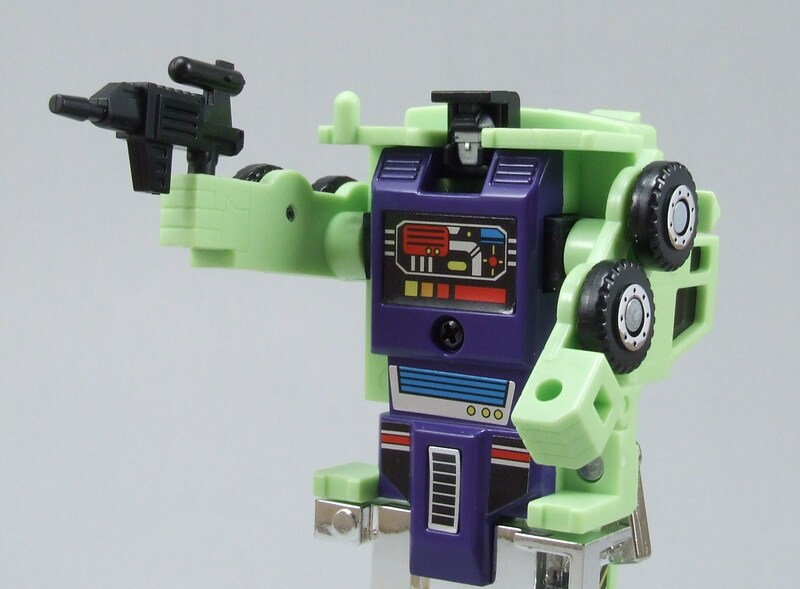 Unhappy with unglamorous role, but understands its importance… helps build Decepticons’ massive energy-recovery installations. As vehicle, can carry 90 tons for 1200 miles, use a dual heat-seeking missile mount. 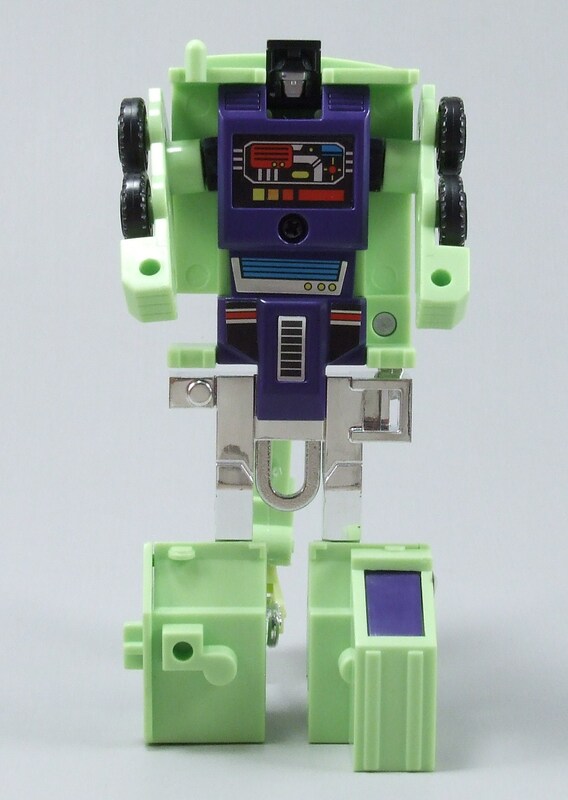 As torso module, combines with fellow Constructicons to form giant robot “Devastator”. Can be goaded into fight in which he’s overmatched. Long Haul … his name just suggests he’s the team’s muscle and ultimate powerhouse. 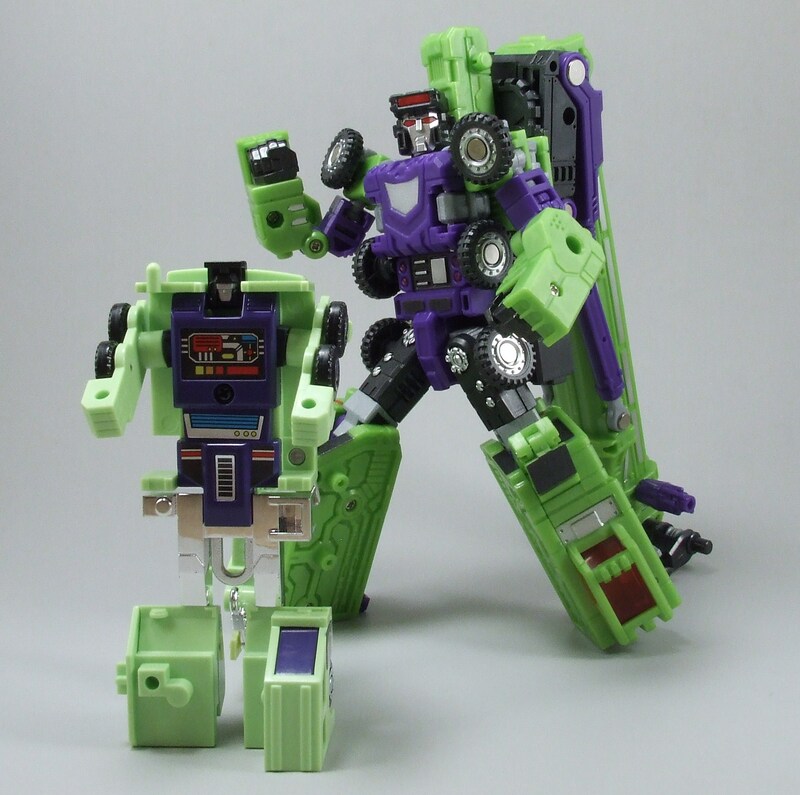 Long Haul has been a middle ground character for me and his toy has been something of interest, but not of extreme importance. 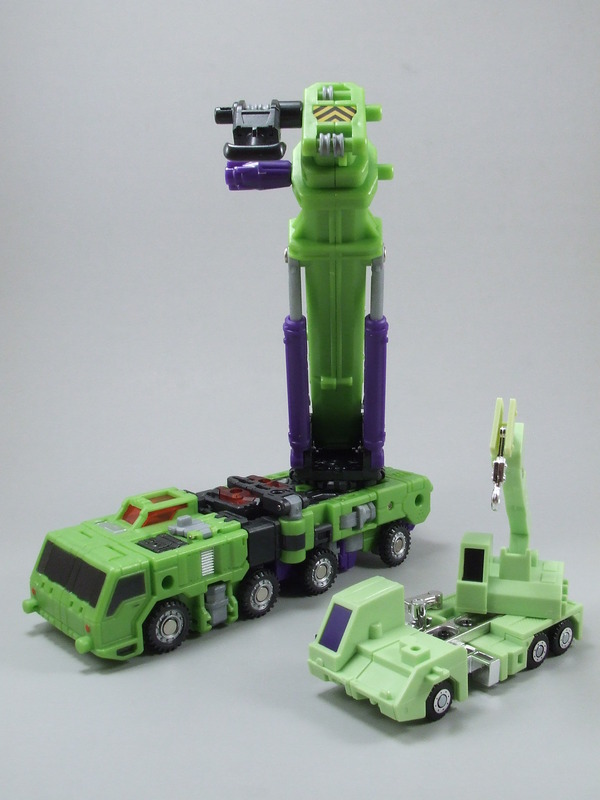 With his teammates Bonecrusher and Hook scoring a very high level of coolness in my book, I’m optimistic about Long Haul and how well his toy will stack up … let’s find out. 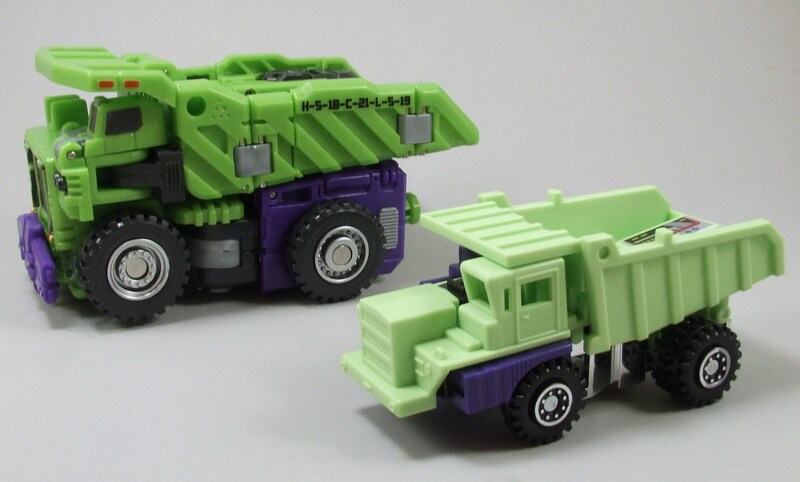 Long Haul’s alt mode, like both Bonecrusher and Hook’s, is definitely aesthetically pleasing. 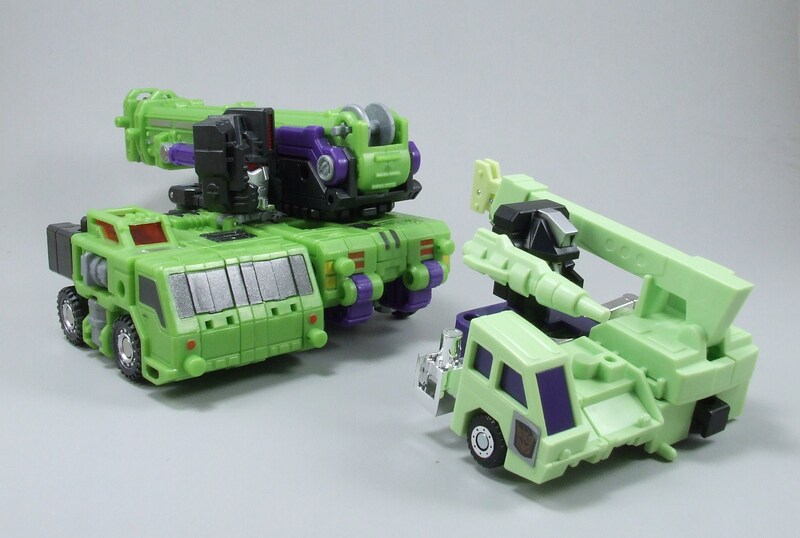 It’s another Constructicon that’s well balanced and looks to be real world applicable. But right off the bat I have issues with this toy; I’m more disappointed than anything. 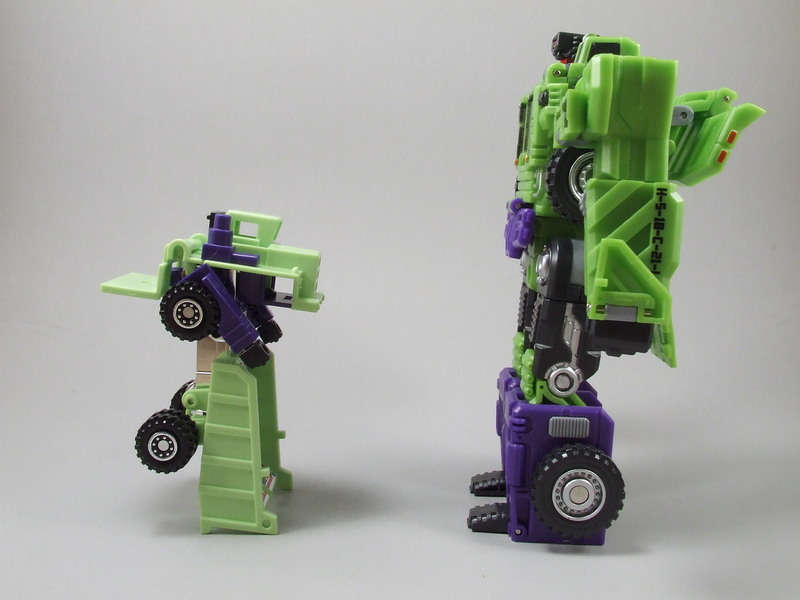 I’ve praised very highly the actual functionality of my recently reviewed Constructicons: Bonecrusher’s working plow, Hook’s extendable crane. 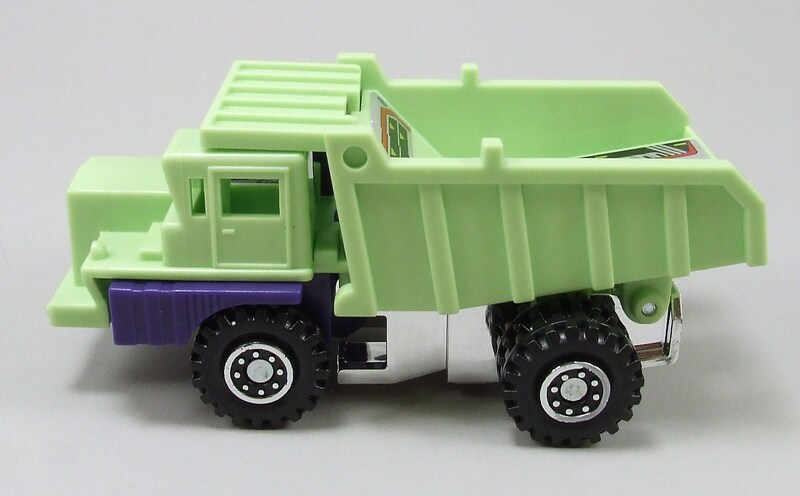 Although Long Haul has a great amount of cargo space as a dump truck, he doesn’t … well … dump. 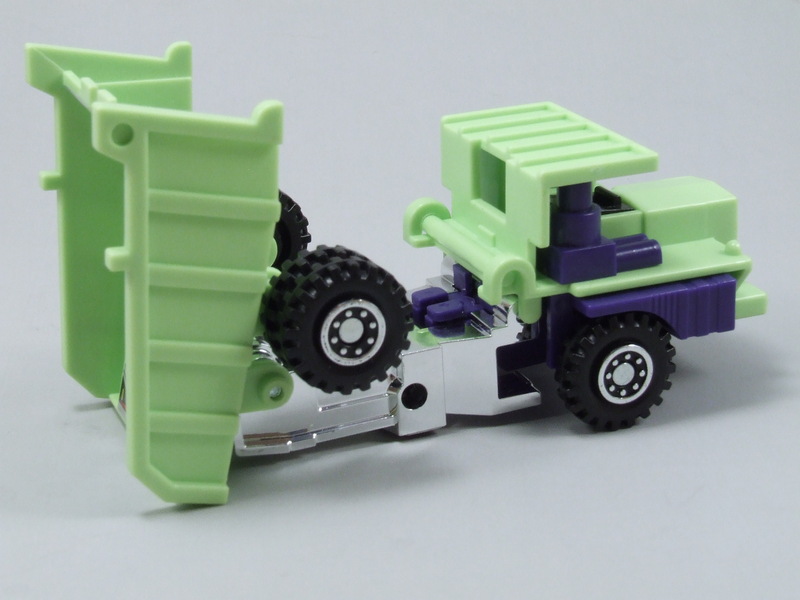 You can fudge your way through by lifting the entirety of his back half to simulate a functional dump truck, but it’s kind of silly to have his entire rear wheels up in the air. An opportunity that might not have been possible at that point in time during the 80’s, but would have been awesome to see! 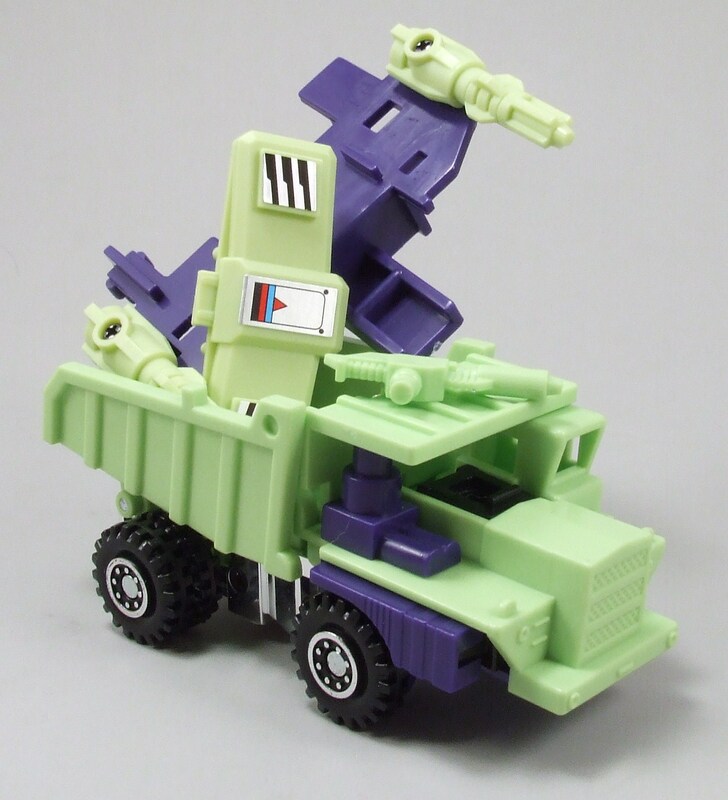 Although I’m griping quite a bit about the lack of funtionality, Long Haul still does his main role well. 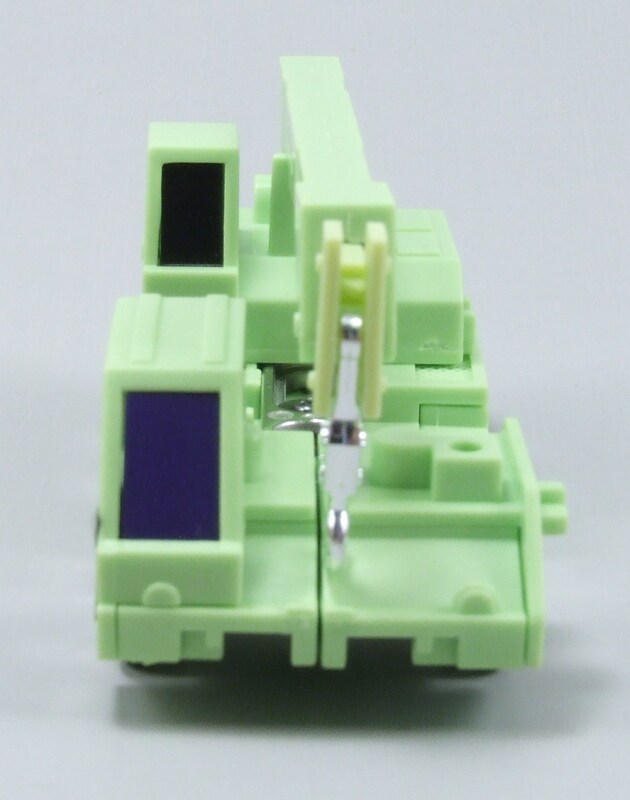 Like I mentioned he does have a good amount of space to load spare weapons or even combiner parts. 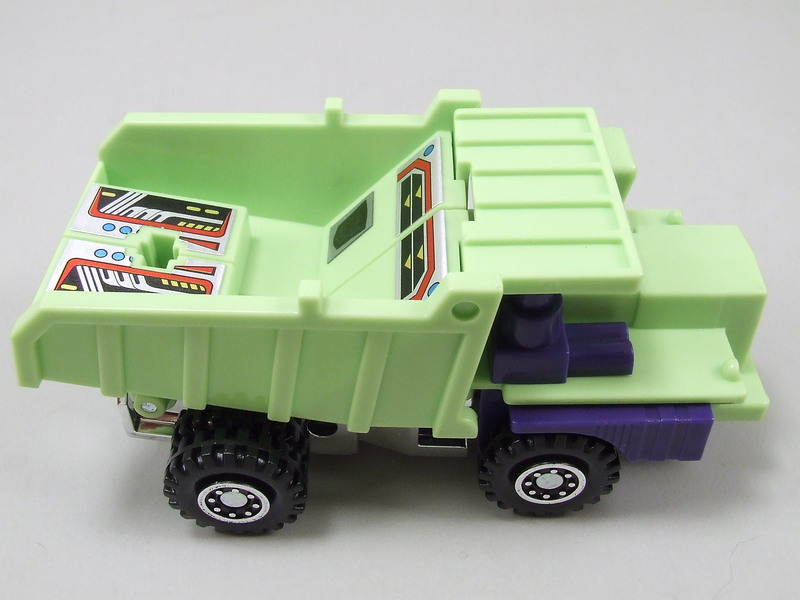 It’s also nice to see a lot of great details in this alt mode: big wheels, huge front grill, wide open driver’s seat, and a huge exhaust as well. 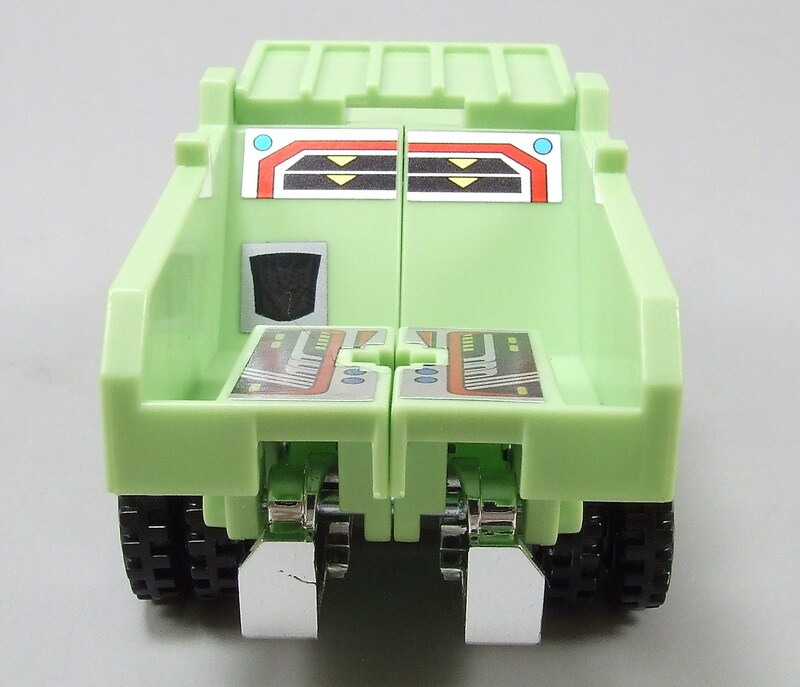 I like this alt mode, it’s just lacking some of the play value that his teammates have. 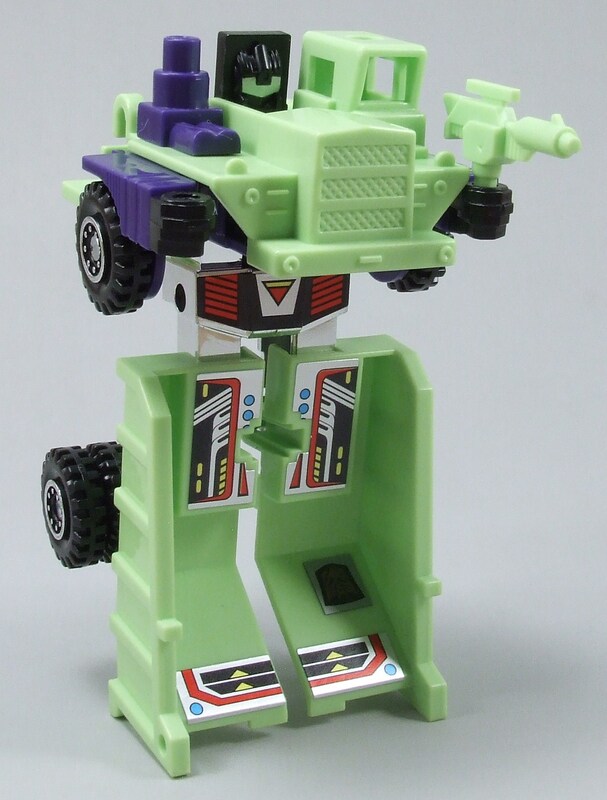 Similar to his teammate Hook, Long Haul’s transformation is another simple transformation with not too much going on. His entire truck bed becomes his legs as you flip them over and lock them in. The front cap is flipped over to become his chest with his head popping out just behind his grille. His arms actually have a cool sequence; his arms are slid out from the front cab area and his wrists are rotated down from the forearms. 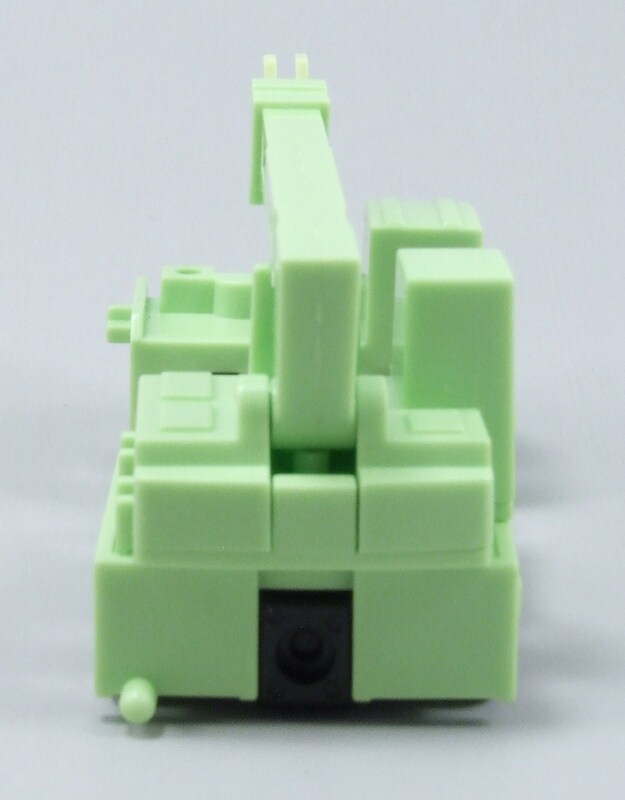 That’s a nice piece of engineering from this figure, which is fun to see. The balanced and well proportioned alt mode of Long Haul does not transfer over to robot mode in the greatest of capacity. 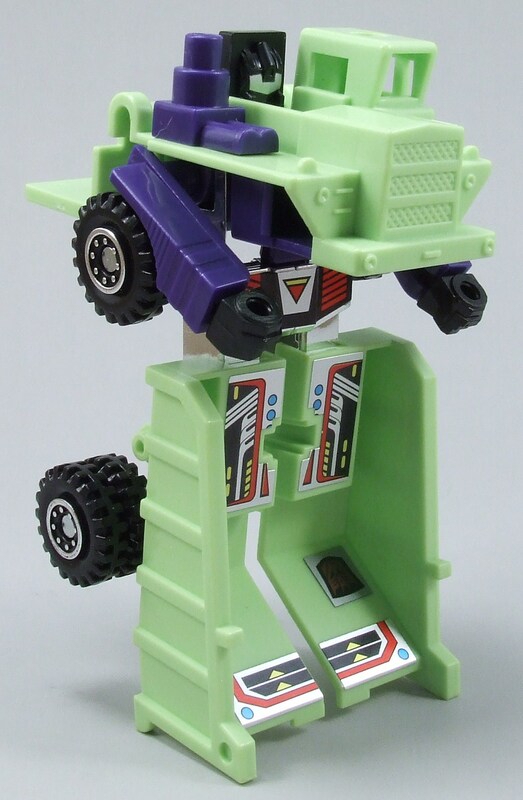 Long Haul still sports a decent looking robot form, but his stature is somewhat goofy. 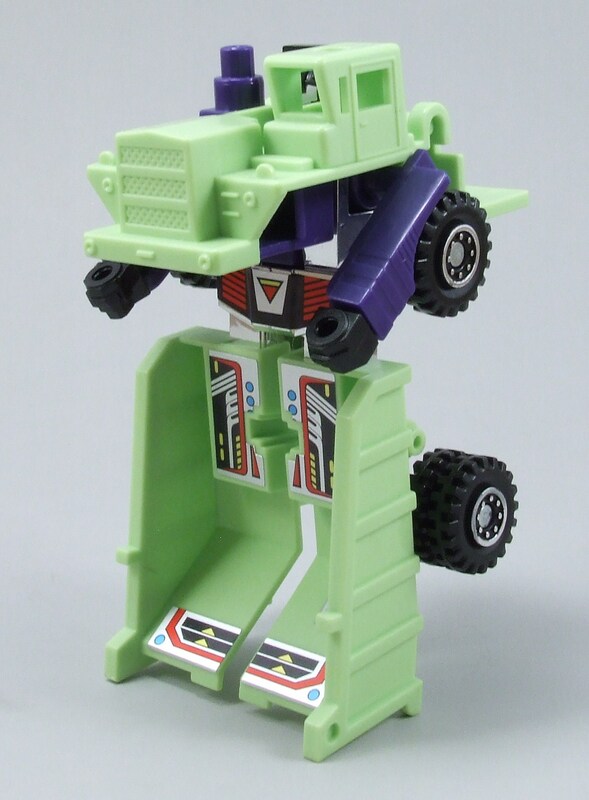 With his entire truck bed being his lower half, it does look like Long Haul has one hell of a set of legs. 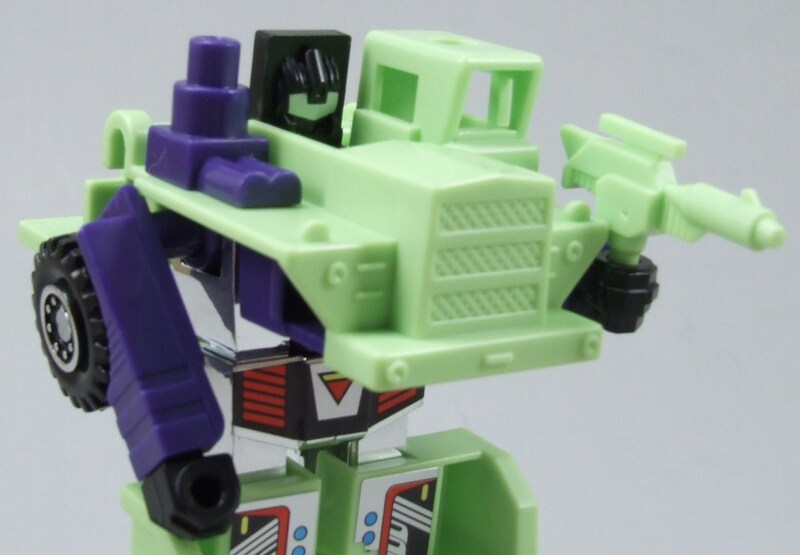 What bothers me most is having his chest/head area be his entire front half of the truck. 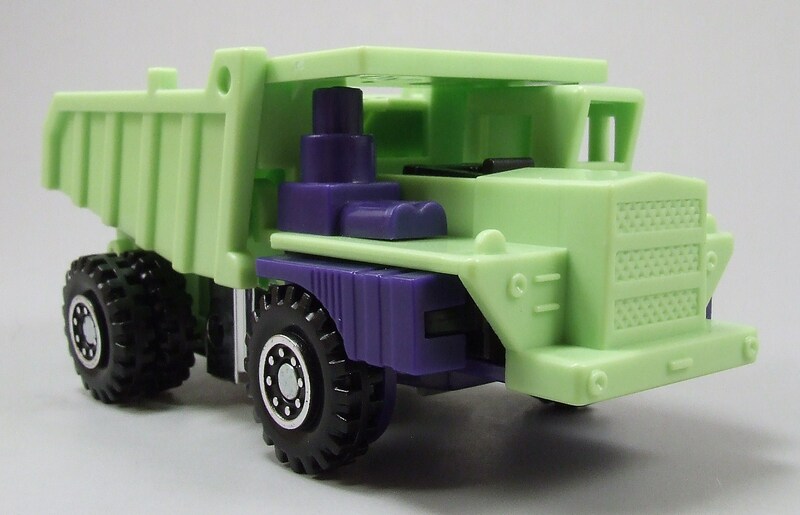 This is really noticeable from the side view where the truck cab and exhaust block Long Haul’s head, not to mention the grille sticks out forward more than anything else. He can have a static gun pose and even raise his arms entirely up over his head for his only battle-ready action pose if you will. 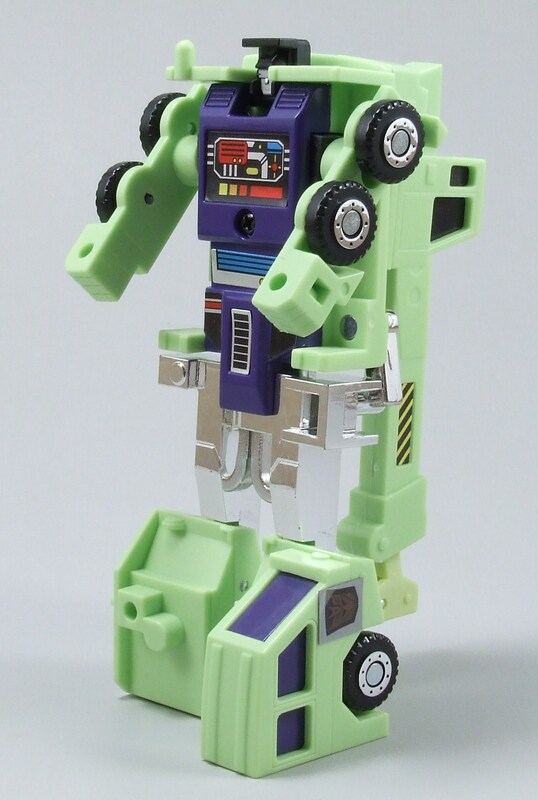 Overall, I think his robot mode is limited to what he has to do in his combined mode, so this robot form is another beefy looking bot without much to fiddle with. 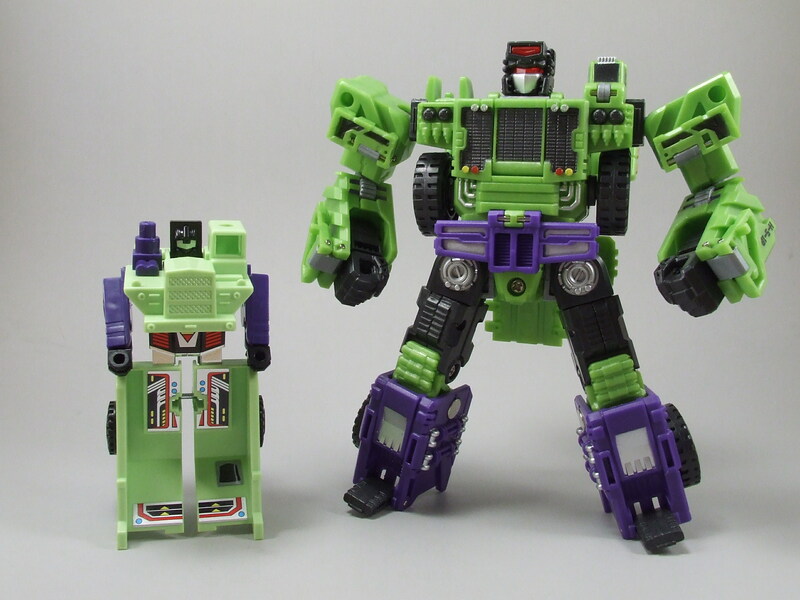 As part of the 6 member team that forms Devastator, Long Haul forms the torso area of Devastator. 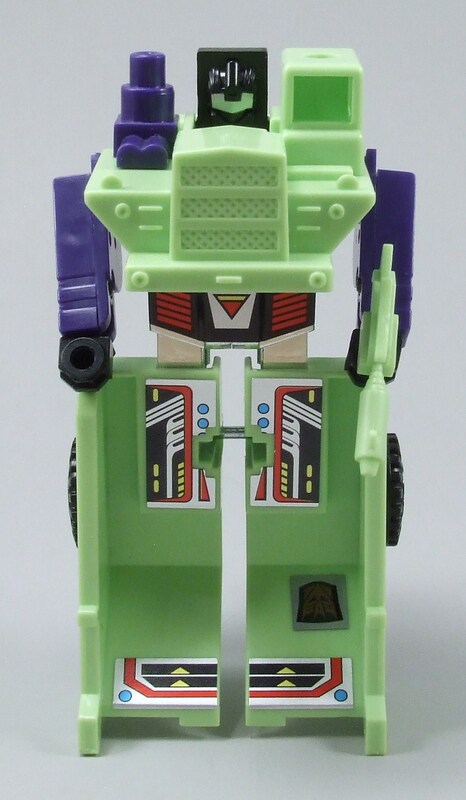 As I mentioned, I think his robot mode suffers from his combined mode responsibility, in which he has to essentially hold the combined form of Devastator together. Here’s the combined form with a little help from Hook. 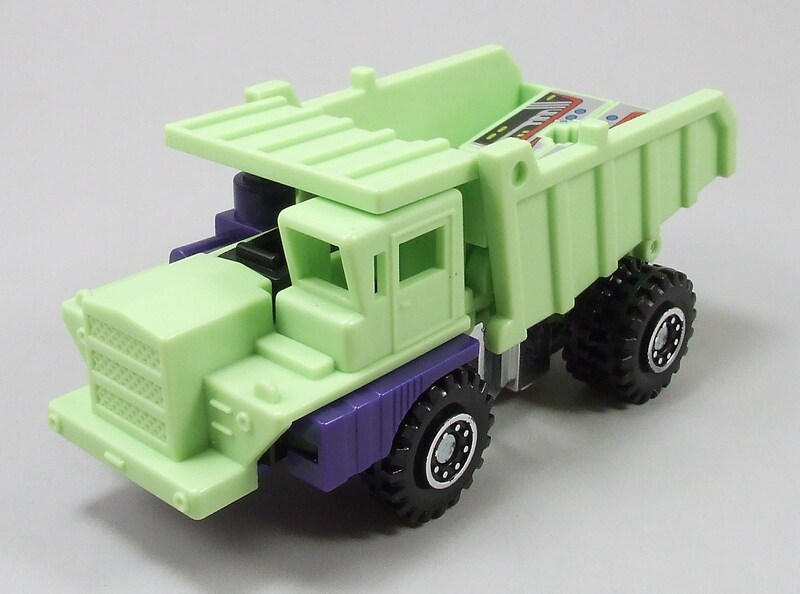 And here I am thinking the lack of functional “dumping” truck bed was “an opportunity that might not have been possible at that point in time during the 80’s.” Maybe this is another case of having limited functions due to their important combining roles, but TFC Heavy Labor also has a lot of the same limitations Long Haul has. TFC Heavy Labor has a gorgeous alt mode; it’s beefy, heavy, and an aesthetically pleasing vehicle (from the front and side). 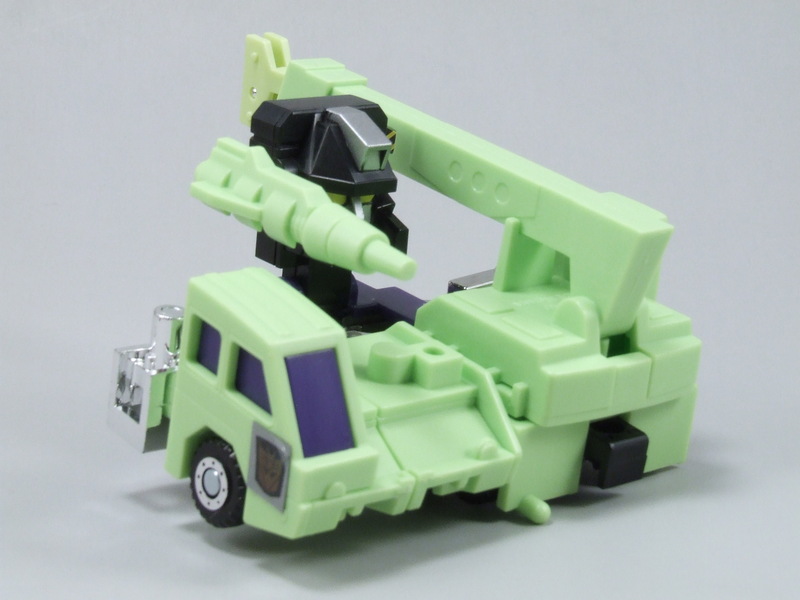 However, it has even less cargo area than Long Haul and also does not have a functional “dumping” bed … you can’t even fudge your way with this figure like you can with its G1 predecessor. 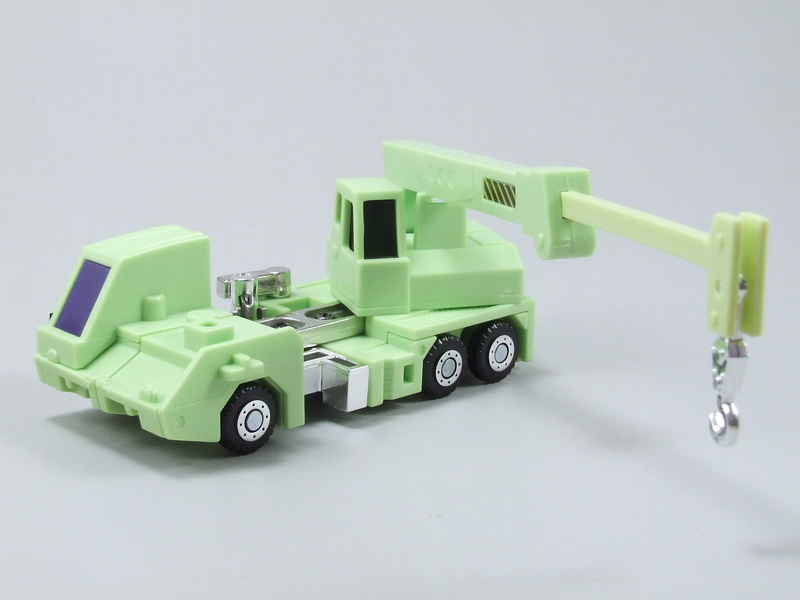 The robot mode is a different story and you can see Heavy Labor shed some of the G1 limitations. 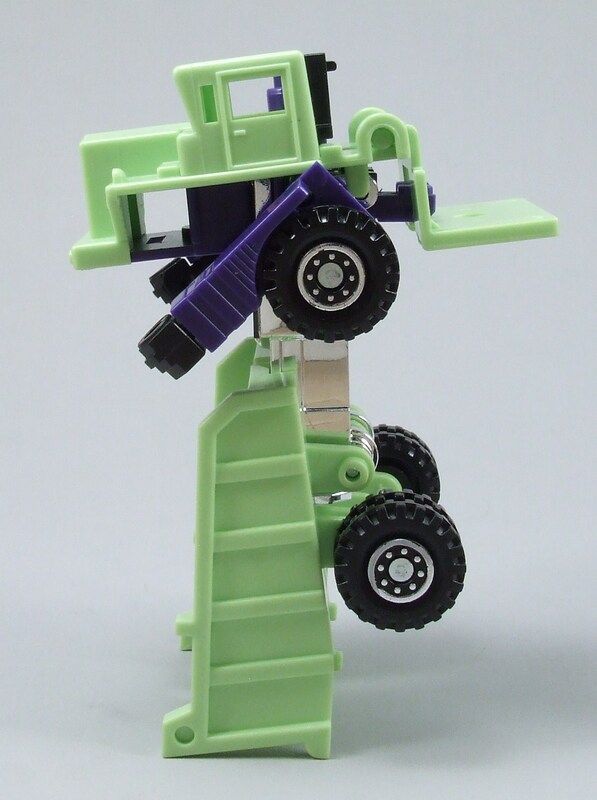 Heavy Labor becomes short in stature, but he now shows off just how strong he is with a wide and beefy body without having his truck parts get in the way. Overall though, I think this is a great enlightening of a comparison because we can kind of see just how limited this particular character has to be in certain forms. 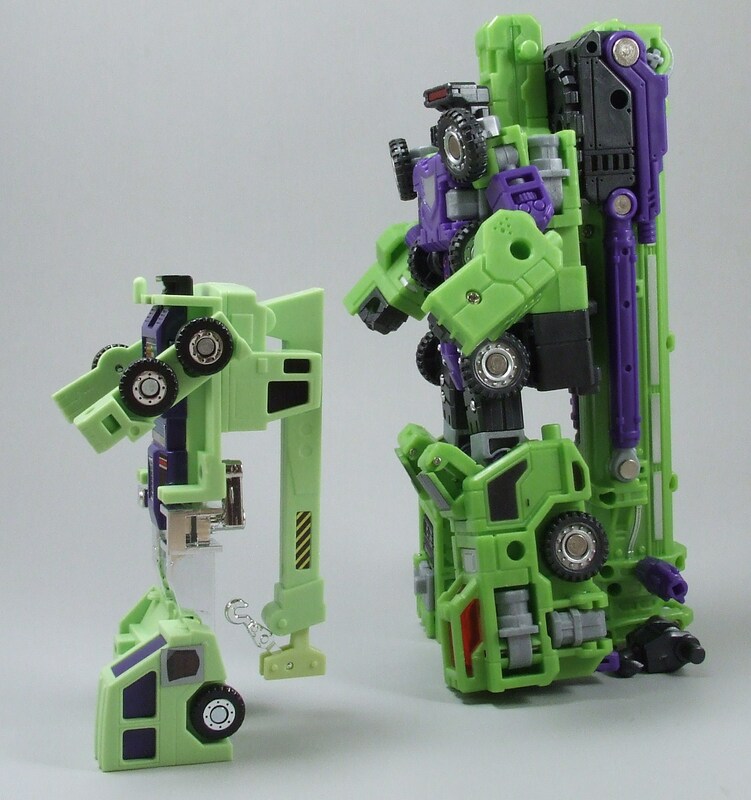 As a whole, I think Long Haul suffers from being such an important part in the Devastator team, especially his robot mode. 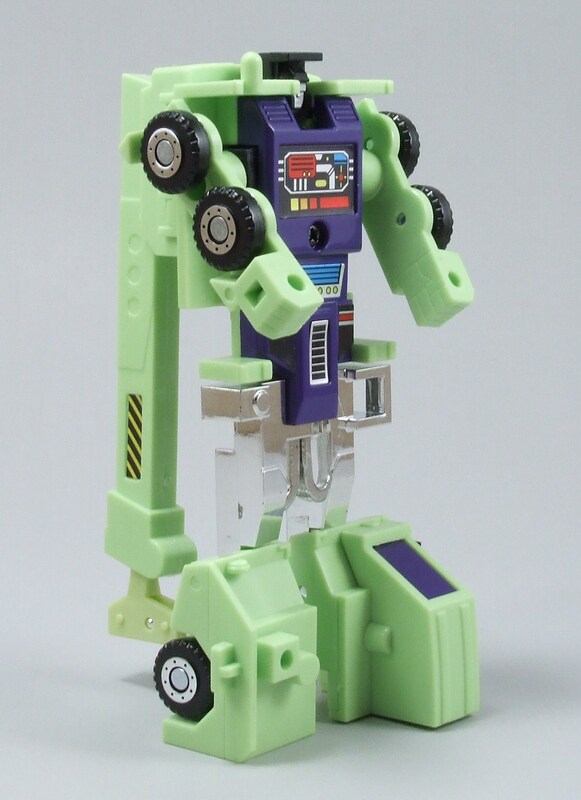 I wish he was more of a functional Constructicon like some of his teammates, but even a modern day engineered figure lacks that functionality. 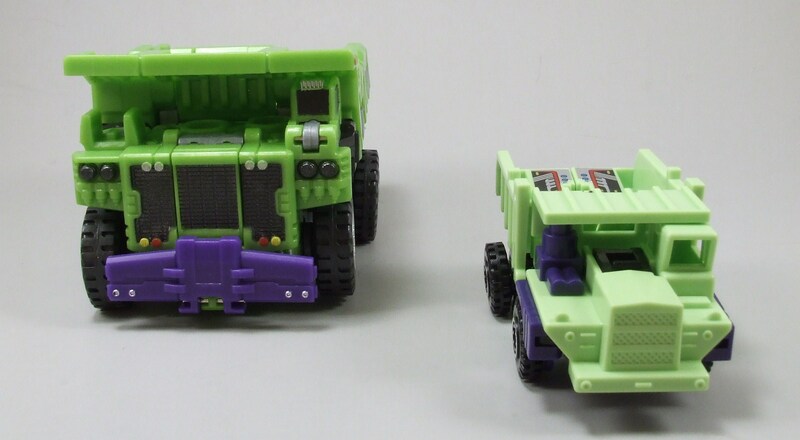 Long Haul still has great value to him by being able to carry a ton of accessories in his alt mode, but his robot form is the weaker of the 2 forms. Overall, a cool enough figure but has some disappointments along the way. 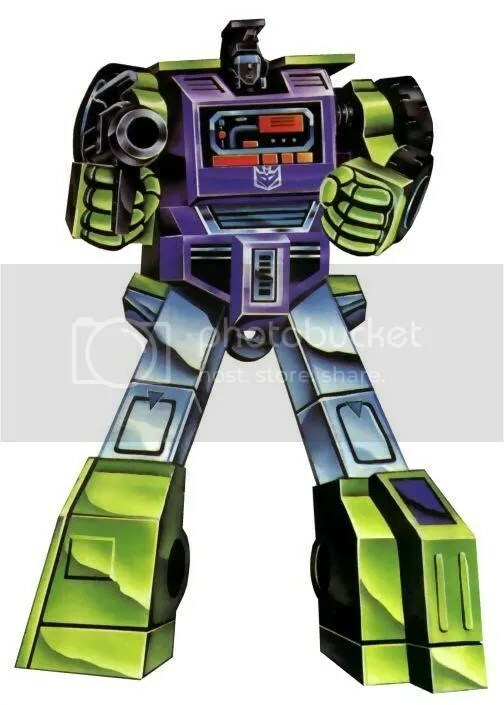 With precision of a fine jeweler, performs his job with skill unequalled among The Transformers, whether reconnecting a damaged microchip or setting a two ton girder into place. Snobbish, supercilious, unpopular perfectionist. Lifts 20 tons. 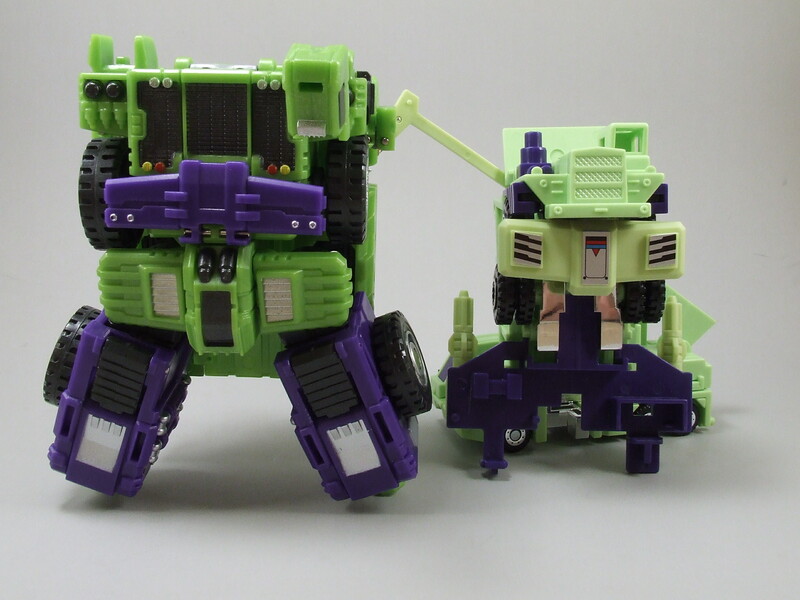 As shoulders and head module, combines with fellow Constructicons to form giant robot “Devastator”. 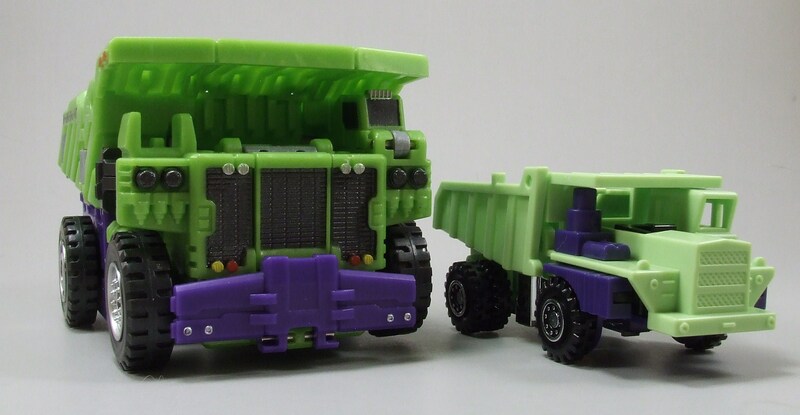 Aesthetically speaking, I have always been drawn to Hook’s alt mode more than other ‘Cons and because of that he’s been one of my most desired Decepticons during my collecting of G1 figures. I’ve been very excited to get my hands on Hook and see what he’s all about – so far I haven’t been disappointed. He’s a very important part of the powerful Devastator, but for the time being I have no issues with focusing on his individual traits. Let’s get started! 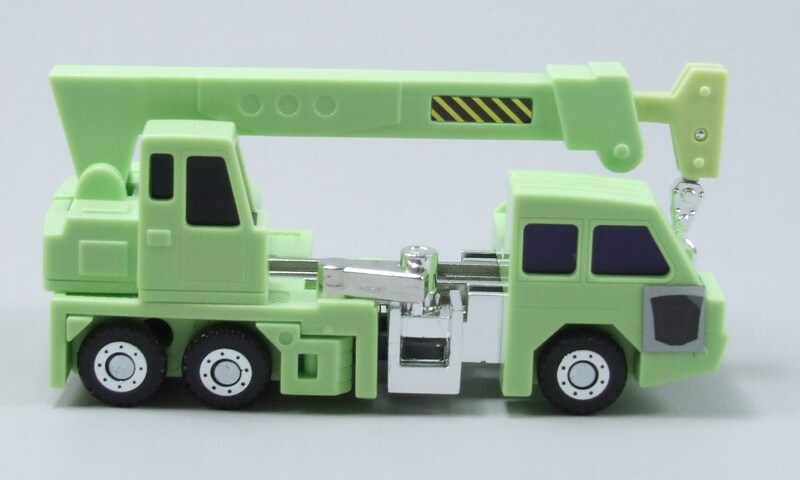 Hook’s alt mode, a construction truck crane, as I mentioned is very aesthetically pleasing for me; it just seems to be right. 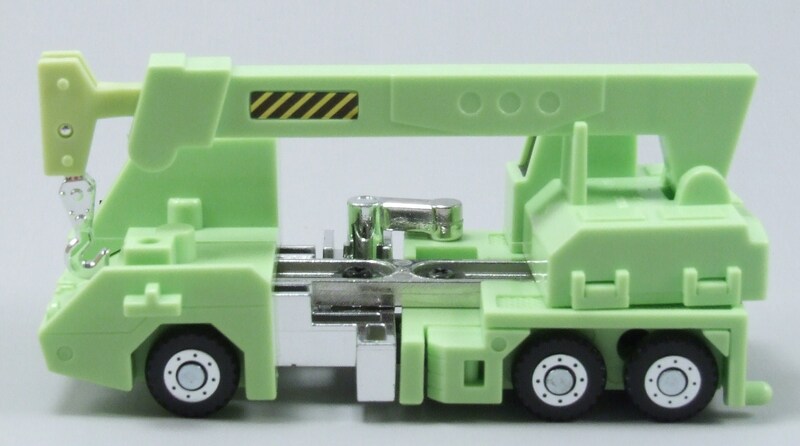 The proportions are all there balancing so well between the cab windows, his 6 wheels, and even the crane and hook itself. 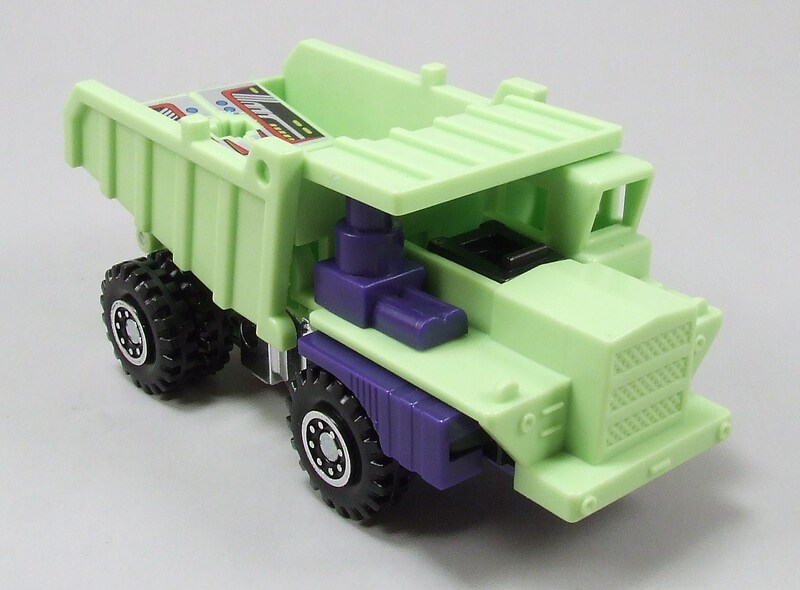 This alt mode, like Bonecrusher’s, is practical and functional. 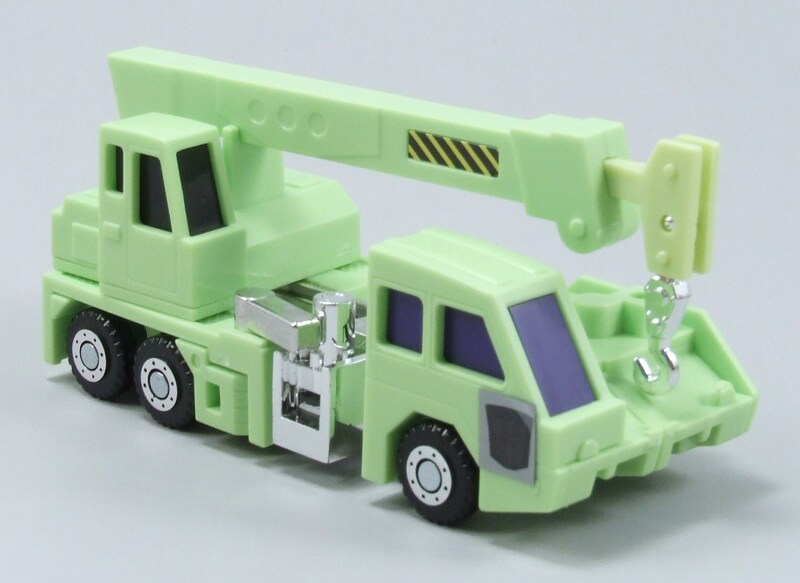 Hook’s crane is fully extendable up to about 6.5 inches; that’s nearly twice as long as the vehicle itself! 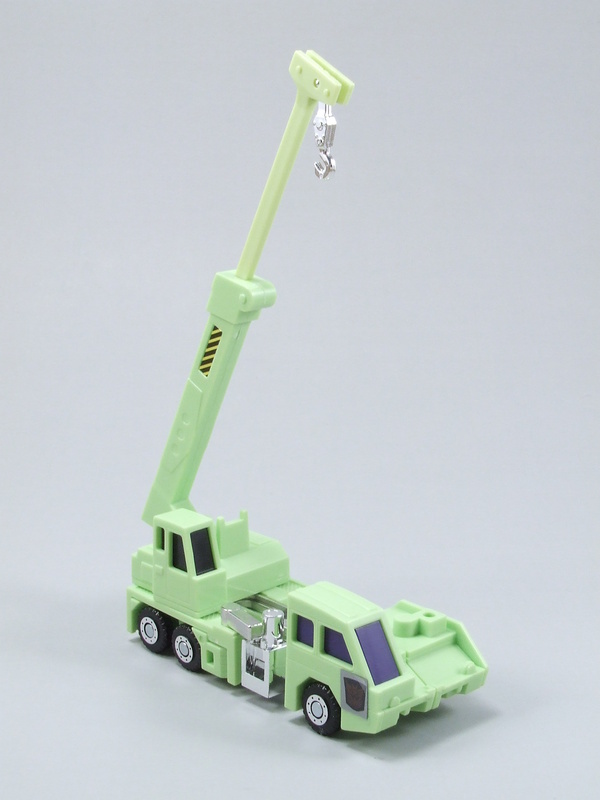 Even more cool is how the base of the crane is a fully rotatable 360 degrees – downright functional and awesome. I can surely see Hook being a popular toy among kids because you are getting so much “bang for your buck” with this figure. 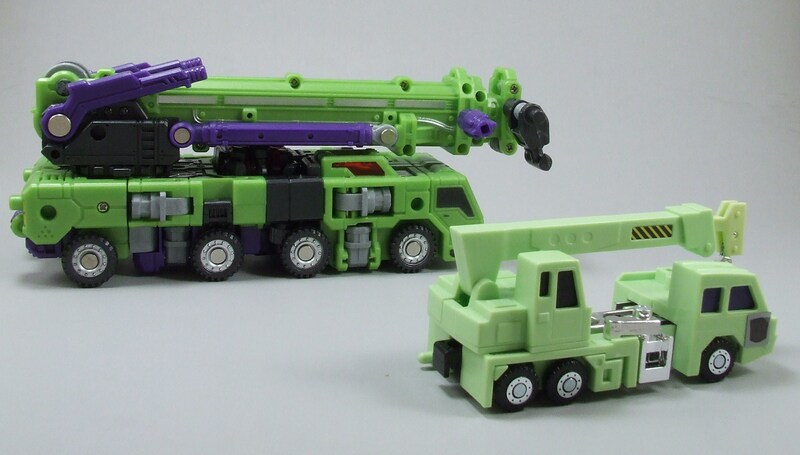 Beyond the functionality of the toy, the dominant green color is complimented so well with the hazard stickers and purple/black windows. Nothing is forced, nothing is out of place. Let me not forget the absolute gorgeous die-cast thrown in there too! His middle section is full on die-cast giving Hook a very heavy and sturdy feel to him. And although his hook isn’t die-cast as well, it still has a great chromed look to it which makes the main tool of this Transformer just POP! 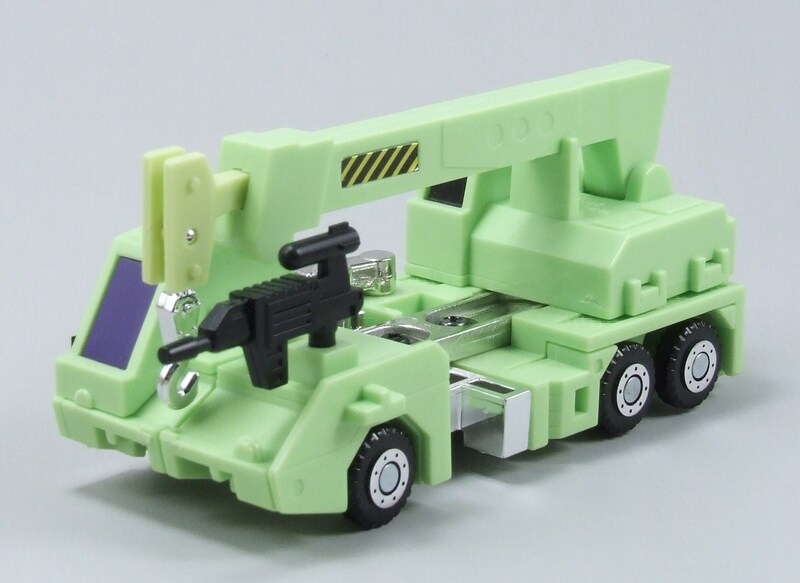 I love this alt mode for its functionality and aesthetic features. Without moving forward to robot mode I would be satisfied with this purchase, but where’s the fun in that? Hook – TRANSFORM! 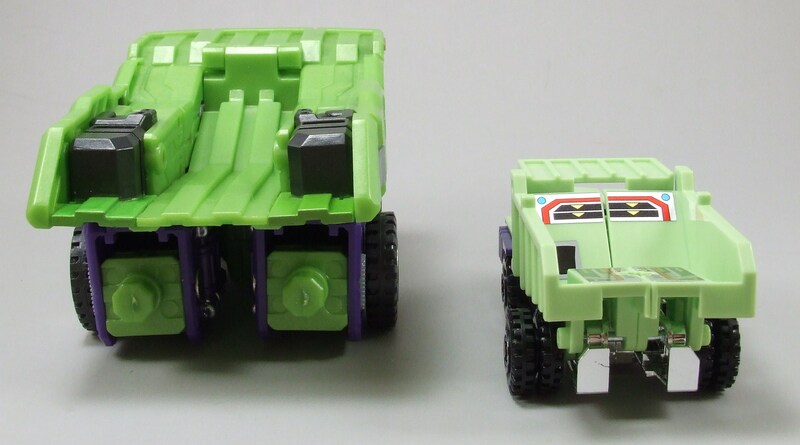 Despite a less than exciting transformation, Hook has a great robot mode that carries a lot of aesthetically pleasing features over from his alt mode. I’ll start with the perfect blend of colors on Hook – just look at ’em! 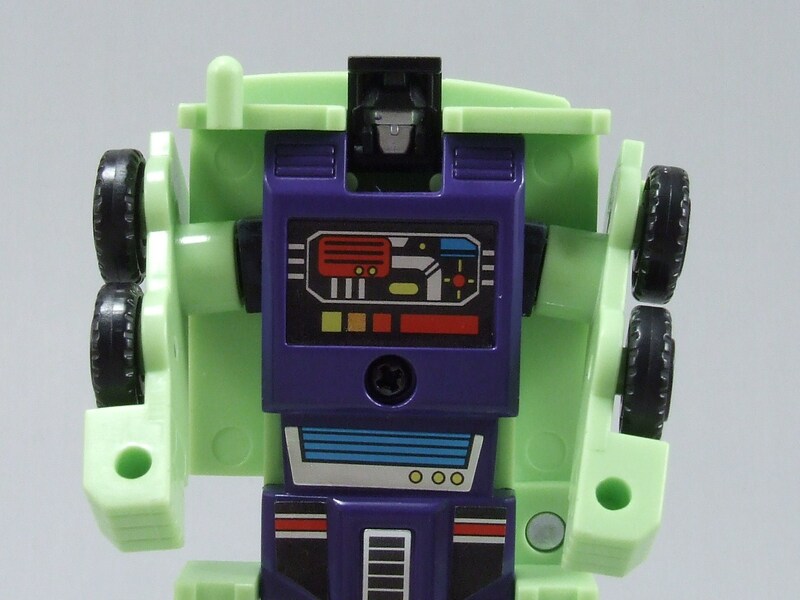 The green is mostly taken over by a dominant purple chest that looks fantastic with the Cybertronian tech sticker placed on it. 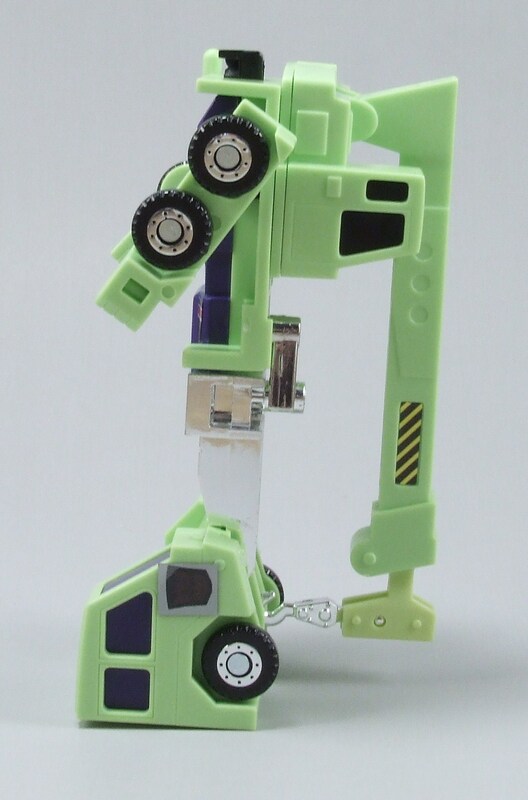 The die-cast middle piece that worked so well in the crane alt mode also has a presence for Hook’s legs, although it is a little harder on the eyes with the die-cast “U” hanging between his legs (really, there’s not a joke there). Articulation is limited to his arms moving up and down, just enough to strike a static gun pose. I guess if you wanted to you can do something with his crane tool because it does still rotate, although balance will become an issue really quick. 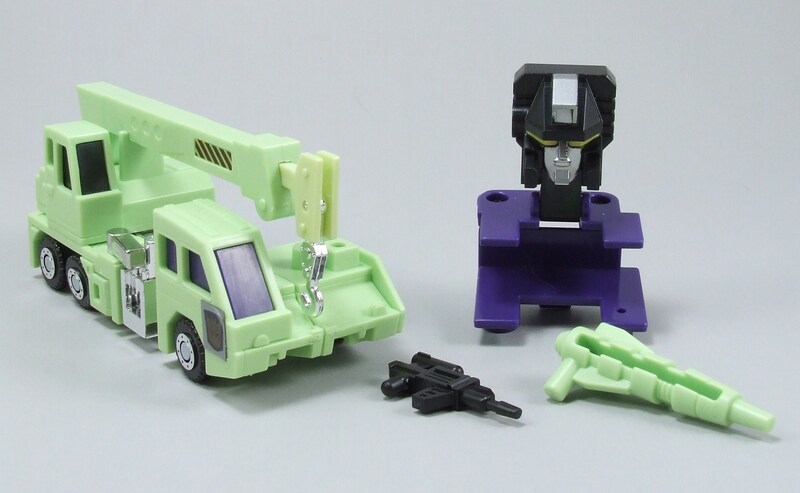 Overall, robot mode for Hook is a decent win. Not too much to play with, but a pleasure to display. 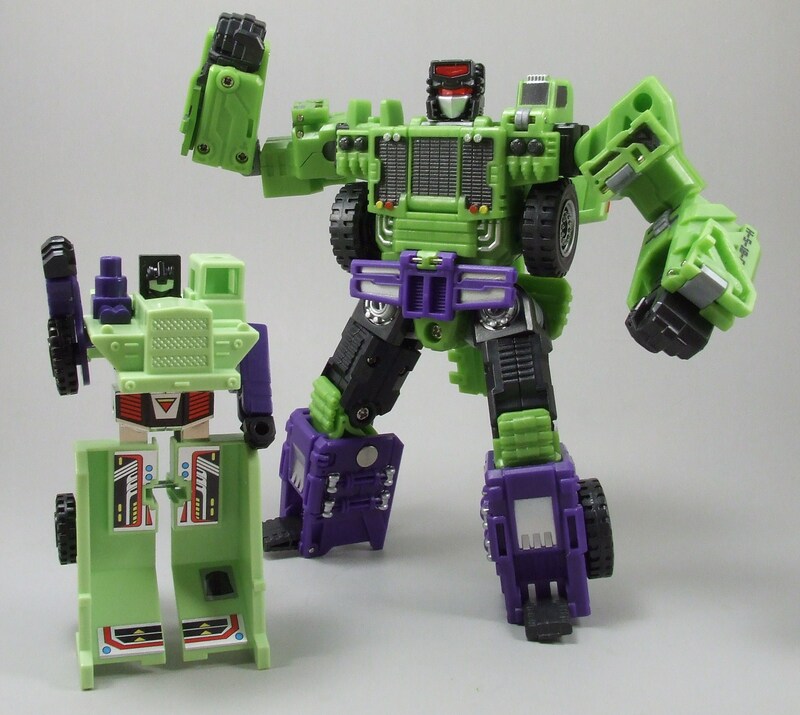 As part of the 6 member team that forms Devastator, Hook has a very specific role in the combination: Devastator’s chest and shoulders. Let’s not spoil it all in this post though … more to come! 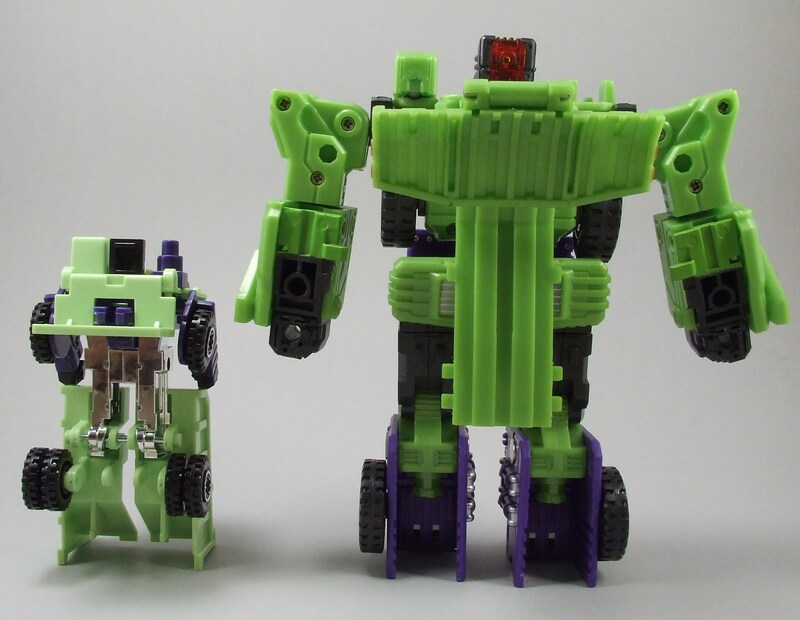 Keeping with the theme of using the TFC Hercules bots as a Classics comparison – just imagine G1 Hook as a bigger, blockier, and more articulated figure (not by much though) and you have the TFC Dr. Crank figure. 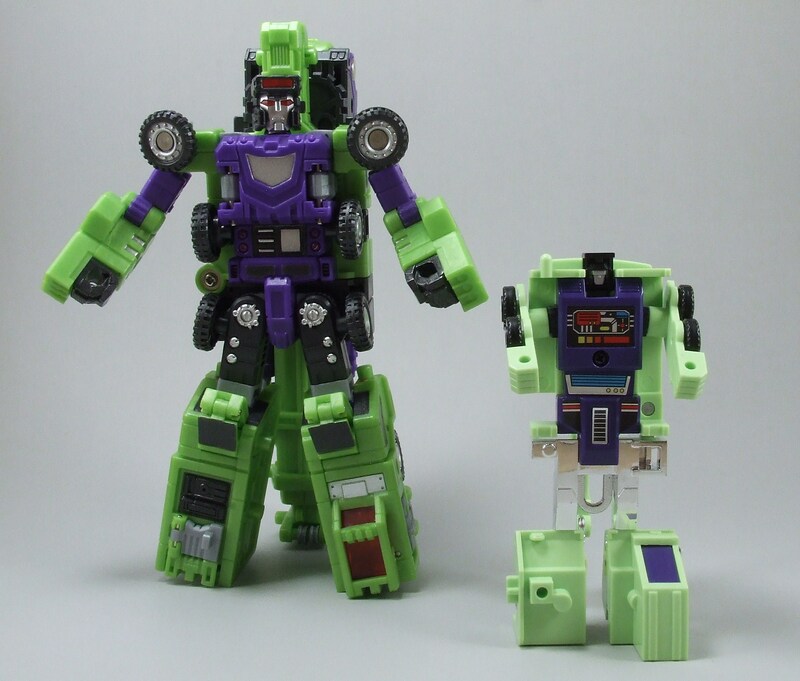 As you can see in the pictures, the TFC Dr. Crank figure is a decent evolution from the G1 Hook, but he lacks some serious detail that I love about Hook. 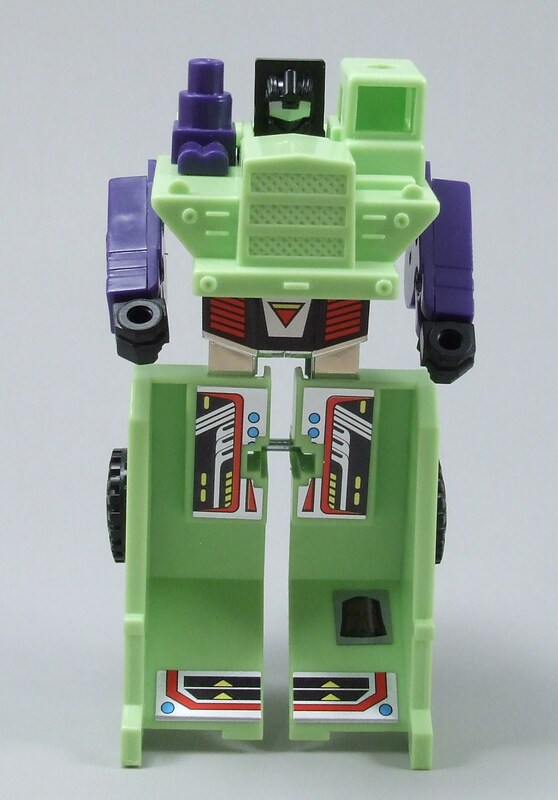 For one, the blend of purple with the green doesn’t seem as vibrant as the G1 goodness. 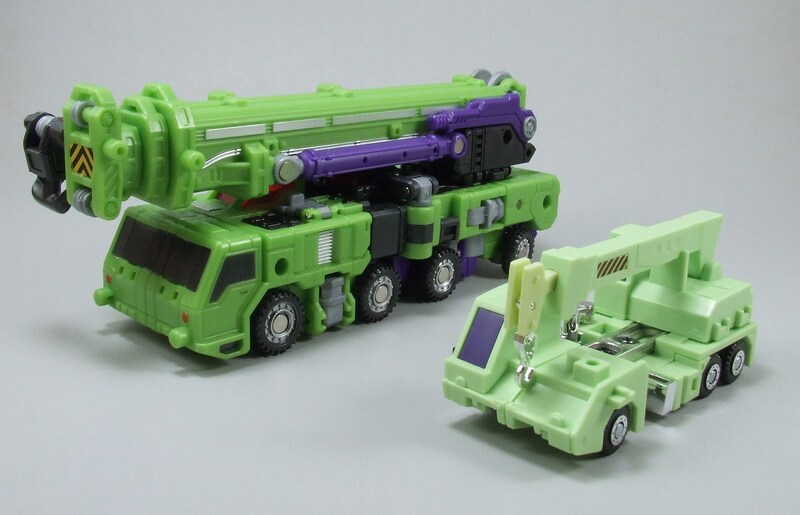 Hook pulled this off so well with the windows in alt mode and the chest in robot mode; Dr. Crank just doesn’t stack up with the dominant green deco and somewhat bland purple. Interesting enough though, both alt modes are where the fun is at. 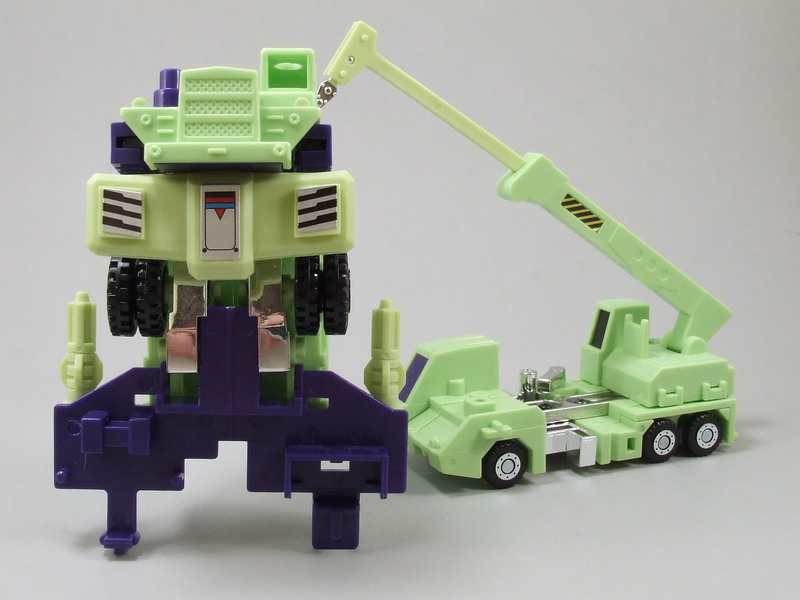 Dr. Crank does a fantastic job of capturing what was so nice about the G1 figure: the crane! I apologize for not having a picture of the crane fully extended … it’s because it wouldn’t fit in my lightbox! 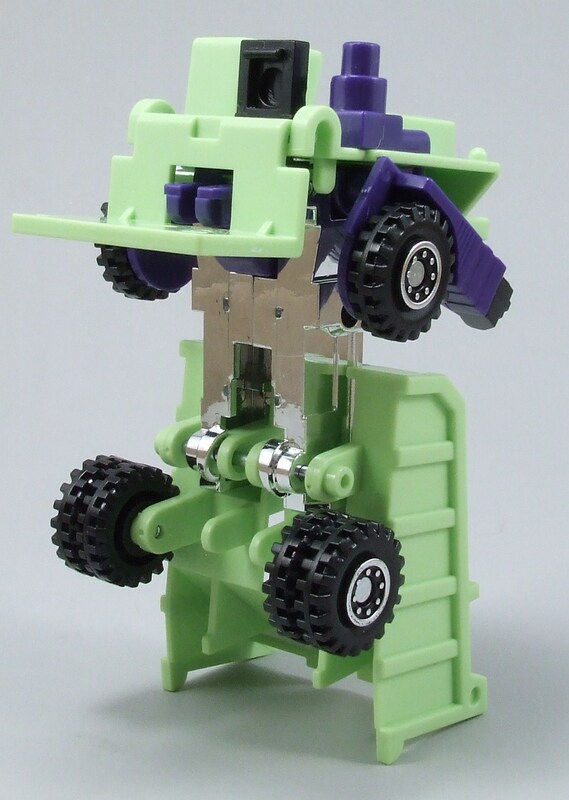 Regardless of my nitpicking, Dr. Crank is a solid evolution from G1 Hook. Hook manages to beat out one of his partners in crime, Bonecrusher, by the narrowest of margins. 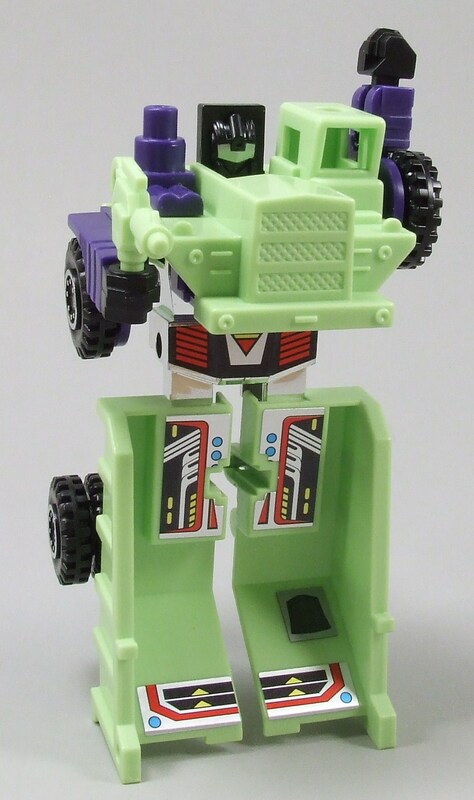 What Hook lacks is a less than exciting transformation with a robot mode that doesn’t have a ton of play value, but he more than makes up for that with an alt mode that is PACKED with fun and a blend of colors that make Hook stand out on any display shelf. I have a feeling I’m going to appreciate this figure even more when his full transformation is revealed with his other 6 team members. For now though, Hook is a solid 8/10.